I was moving towards a new display case. First, I saw the spindles. Then, my eyes drifted to the right, and there they were: A pair of socks, in beautiful condition. 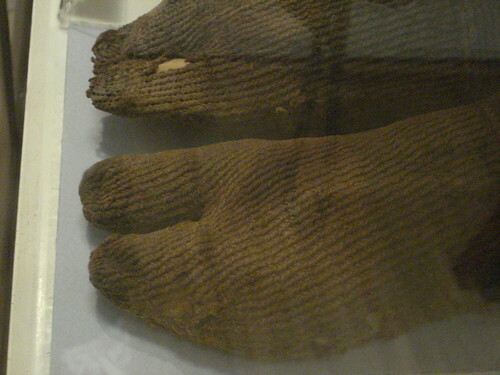 Sure, there were a couple holes, but these socks are 1700 years old, and they're in better shape than some of my own knitted socks! Interestingly, these socks feature a split toe - like 'tabi socks' or sandal socks. They're fairly short and have a rolled hem. If you look at the stitches, you will see the distinctive 'v's that may remind you of knit fabric. In fact, if you knit a pair of socks, and twisted every stitch, the result would probably look very similar. 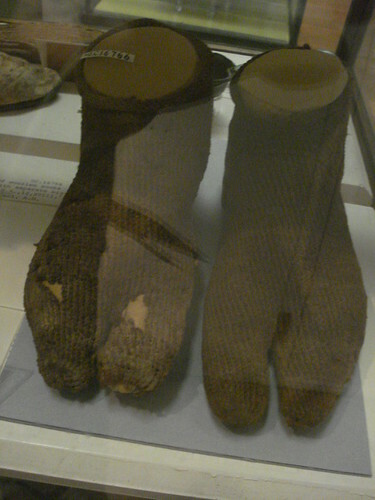 However, these socks aren't knit -- instead, they were fashioned using an older technique that involves a blunt needle and short lengths of yarn -- nalbinding. Nalbinding is a Scandanavian term, which simply means 'needle binding'. It is also referred to as 'knotless netting' or 'single needle knitting', though it is not technically knitting. In knitting, loops pass through loops, while in nalbinding, thread passes through the loops. This means that nalbinding doesn't unravel the way that knitting does. You can have a look at the construction of some nalbound stitches here. 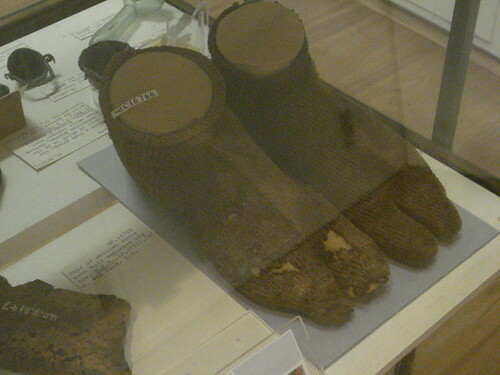 While researching the Petrie socks, I came across (actually, was alerted via Twitter about) a fabulous blog written by some ladies who set out to recreate the socks! 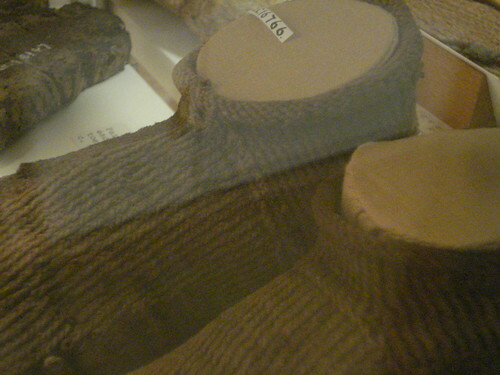 The blog includes several patterns, tutorials on the Egyptian method of nalbinding, yarn construction, other fiber artifacts at the museum and other extant examples of nalbound Egyptian Coptic socks. See all my Egyptian textiles photos on Flickr. There is now an article about these socks in the November/December '11 issue of Piecework. I've heard about these socks, it must have been very cool to see them in person!